I love exploring a new city, something I recently had the chance to do in Barcelona, Spain. There was so much to experience, but with only a few days, I focused on a short list of “must sees." Barcelona is elegant - with broad, tree-lined boulevards and a wide variety of architectural styles. Many of the buildings have beautiful facades and ornate balconies, giving the city an air of gracefulness and charm. When visiting Barcelona, be sure to leave plenty of time to wander and marvel at its unique architectural character. The “main drag” of old Barcelona Is La Rambla, a pedestrian path that stretches from Plaça de Catalunya to the waterfront, through the heart of the Gothic quarter. 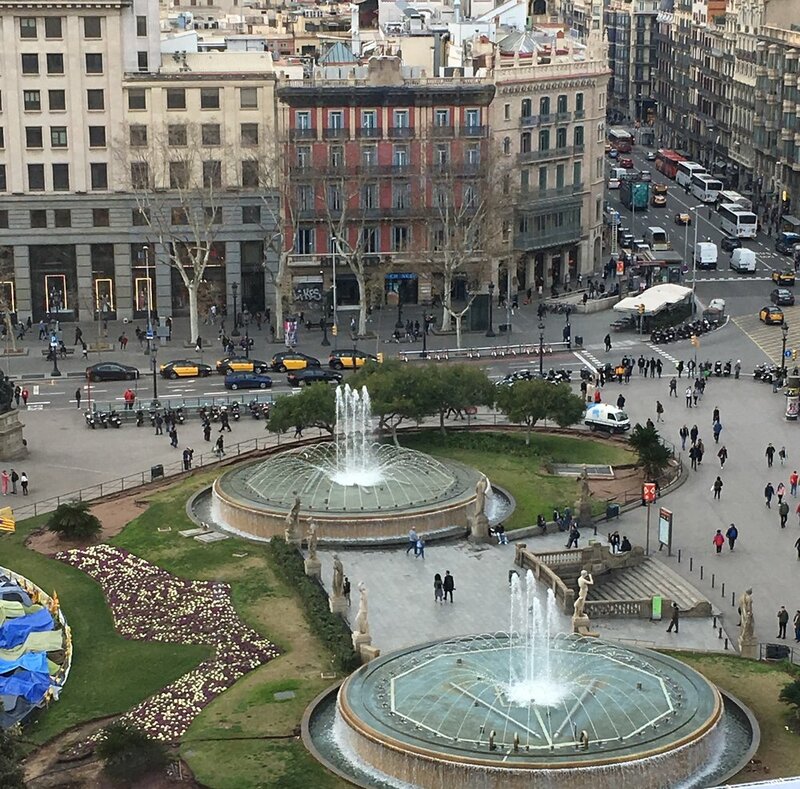 La Rambla is lined with interesting sights, including fountains, art (look for a Miro mosaic on the pavement), historic buildings, and the lively Boqueria market - a good place to find some uniquely Catalonian street food. There are street performers and cafes, as well as kiosks selling everything from newspapers to souvenirs to flowers. A stroll along this vibrant street it is definitely something to experience when visiting Barcelona. One of the most enjoyable parts of my trip to Barcelona was the time I spent in the Palau de la Musica Catalana. This ornate building, constructed in 1905 as a performance venue for a local choir, is a UNESCO World Heritage site. Tours, offered several times a day and lasting about 45 minutes, explain the building’s modernista style, design elements, and unique history. The tour also gives visitors the opportunity to climb the grand staircase, visit the balcony, appreciate the beautiful stained glass windows, and experience the acoustics of the theater. Afterward, the cafe, with its intricate architectural details, provides the perfect setting for a coffee. Not far from the Palau de la Musica is the Cathedral of Barcelona. The most interesting parts of the cathedral to me were the building itself and the cloister area with its central fountain and flock of geese (tended here, they say, for 500 years). Markets are always a highlight of any trip for me, and though the Boqueria Market is larger, the Santa Caterina market was my favorite. It is a neighborhood market, filled with local products and local citizens. If food is a marker of local culture, then Barcelona is all about fresh fish (I counted at least six seafood vendors) and Spanish hams. The market also had a variety of fresh local produce, spices, and enticing pastries and breads. The real show stopper in Barcelona is the genius that was Antoni Gaudi. It is his architectural style that provides the most lasting impressions of the city. From his signature creation, La Sagrada Familia Cathedral, to the quirky Park Guell, and his whimsical buildings, his influence on the character of this city is indelible. Gaudi built elements of nature into all of his designs and the interior of La Sagrada Família Cathedral presents itself as a divine forest full of trees and sunlight - the most unique church I’ve ever visited. The exterior, still unfinished after more than 100 years, has dramatic facades and soaring bell towers in a style that can only be described as "Gaudian" because there is simply nothing else remotely like it. Major work continues today, with a projected completion date of 2026 - the 100th anniversary of Gaudi's death. Likewise, the Park Guell (photos below) enchants with its fanciful architectural elements and its natural park setting. Gaudi made fascinating use of mosaics here, along with structures that were artistic and functional. Many first-time visitors miss this park, which is only a short taxi ride from the city center, but I highly recommend spending time here.